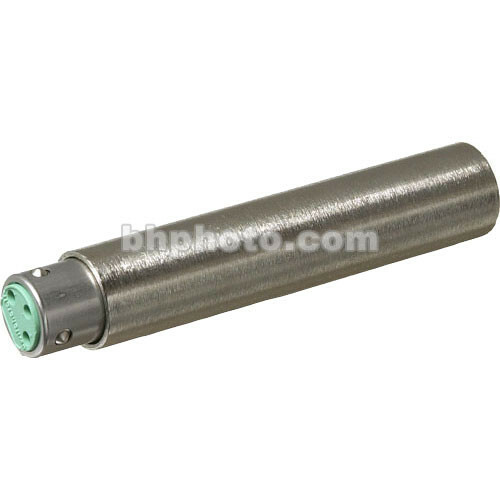 This Sennheiser in-line XLR barrel adapter is supplied from PSC and supports older condenser microphones requiring 12V A/B T-powering for operation, acting as a converter and allowing use with mixers, microphone preamps, or cameras supplying 48V phantom power. Box Dimensions (LxWxH) 4.0 x 2.0 x 0.5"
PSC 12TP48 - 48V Phantom to 12T Power Adapter is rated 4.9 out of 5 by 9. Rated 5 out of 5 by rersk from Great Accessory for an Older MKH416 The Sennheiser MKH 416T of the 1970's and 80's are still excellent microphones that will not work with contemporary phantom power supplies. I was using mine with the original T power supply box with pretty weak sound in-put. When I got this adaptor my old MKH 416 came alive again on phantom power. Still an amazing microphone and superb with this adaptor. Rated 5 out of 5 by CG Sound RX from Sennheiser vs PSC models FYI if you order this Sennheiser model you will get the PSC model in any case. (Or at least that happened to me twice). As far as I have been able to research there isn't a Sennheiser model with the steel, tough casing, that I am used to. (Perhaps there used to be but I can't find one?) Nothing wrong with the PSC but it is irritating to be shown a photo of a solid looking Sennheiser adapter to always get the slightly less rugged feeling PSC. Rated 4 out of 5 by Anonymous from A bit pricey but does its job I'm using this on an old Sennheiser MKH-815 mic, which I got very cheaply because we all thought it was broken. With this adapter it works wonderfully. I'm quite happy to get this mic back into service again and sounding wonderful! Rated 5 out of 5 by Jim from T power revival This little dongle revives 30 year old T power Sennheiser 416 and 816 into modern day phantom powering mics. Simple solution to an old problem. Rated 5 out of 5 by Rob Ellis from Happy with it I use this with a T-powered shotgun mic. This enables an older mic like the 415 to be operational. Great product! Rated 5 out of 5 by Anonymous from Great service from bhphoto! The product was delivered to my address in the quickest time possible and works perfectly as it should. Thanks! Rated 5 out of 5 by Dan from Perfect For Older Mics Using it for my Sennheiser 415. Does exactly what it's supposed to do! Rated 5 out of 5 by Le Field Mixer Man from Sennheiser Phantom Power to T Power This little device changes phantom power to T power for microhpones - older microphones. T power and phantom power lived side by side but phantom became the standard. This adapter works flawlessly. If your mic (actually your mics phantom powered brother - b/c your mic is the T powered version if you need this) can run on less than 48V, say 24V, 12V or 15V phantom, then it will also work with this adapter - tested with a Sennheiser 416T and 15V phantom. It seems secure enough and connects well. It's a solid built adapter and I don't think I'll ever need to replace it. I wish it was smaller though because I'm using it with a boom. Though it just occured to me that I can run a short XLR from my mic-pre to this adapter then my cable to the mic, so this issn't sticking out of my mic-pre and to lessen the weight (and fit better) in my zeppelin. Besides, it probably can't be any smaller because I'm sure it needs a transformer in there and you just need a certain size when it comes to those things. It does one thing. It does it well. If you need this just get it already. If you have an older mic and cant get it to work at all, there's a posibility you need this but RESEARCH your mic model online to determine if they made a T power version. Can this adapter be plugged into a recorder's input directly, or would it need to go recorder &gt; XLR &gt; adapter &gt; XLR &gt; mic? I actually have mine plugged in directly to my 816. And I keep the mic in my zeppelin since I only use it outdoors anyway. Will this unit provide power for a Sennheiser MKH416T from the early 80's and allow audio recording to a professional camera with XLR inputs? Hello, Yes it will power that mic. I too am using it on a 416T. into recorder XLR. One word of caution though - I have ordered the Sennheiser brand twice &amp; have got a PSC version twice - don't know why. I'd rather have the Sennheiser as their barrels are super tough but I can't use the mic. without one! Hope all goes well.